Drag conveyors come in two general styles: single chain or twin chain. Single-chain drag conveyors normally drag a chain with a series flights and paddles over the floor of the conveyor. Twin-chain conveyors employ two chains that run in parallel and carry paddles between them. Most drag conveyors fit into the single-chain category due to cost and simplicity to manufacture. Although this design is typical, it isn’t optimal. There are a number of problems with single-chain designs—with the flights, the paddles, and the chains. A twin-chain design (when engineered well) resolves these problems. The first problem with single-chain conveyors is that they do not drag material evenly. By nature of their design, the paddles collect material on the left or right, since the chain often impedes the distribution of material across the paddle face. As the paddles collect material unevenly, the friction along the wall pulls the chain to one side, tweaking the chain and causing it to “wiggle” up the conveyor. This movement wears the chain pins and bushings more aggressively and decreases the machine’s efficiency. The tendency of single-chain conveyors to move material in a lopsided manner is one reason we opted for a twin-chain design in our SMART Conveyors. In a twin-chain conveyor, the flights hold the paddles on both sides, so material is more easily spread evenly across the conveyor’s width and the paddles don’t twist. The second problem with single-chain conveyors is that the flights are more vulnerable to breaking and bending than twin-chain flights. Ideally, these conveyors will never face loads exceeding their designed limits. But we know what happens to these conveyors in the field: operating crews ignore the specs and overload the conveyors. Or they put things in the conveyors that the conveyors aren’t designed to move. Or something accidently gets mixed in with the material and forms an obtrusion. When an event like this occurs, the single-chain design lends itself to damage. The material uses the paddles like levers to place pressure on the flights. And sometimes the flights break. Other times they bend. Both results are bad. If they break, you end up with a paddle and flight mixed with your material, and these components can damage machinery down the line. If the flight bends, then it no longer functions as a paddle but as a plow. In fact, it is worse than if it broke off as far the chain is concerned because there is now a wedge action along the wall. All material hitting the face of that bent paddle gets plowed tight against the wall, creating high friction along the wall. The opposing flight and paddle, if undamaged, will still push material, but it will heavily tweak the chain and encourage further internal wear. This does not happen with twin-chain conveyors. Paddles are held on both ends, so no leveraging occurs; the flights are less likely to break. And if an overload situation does occur, the paddles tend to bow in the center rather than bend backwards. Thus, the paddle still moves material. The third problem with single-chain drag conveyors is the cost of replacement parts. Some conveyors come equipped with off-the-shelf mill chains. These don’t have paddles; the chain does all the work. These types of chains are dragged through boxes, and they may have flights or a small bar on them. These, of course, are incredibly inefficient and wear out quickly. These are the dumbest of dumb conveyors. But most single-chain conveyors come with custom chains. Their manufacturers design the chains themselves and add custom flights and paddles. When a customer needs to replace the chain, they are therefore tied to the manufacturer. We went with a different approach with our chains in our small and mid-capacity conveyors. 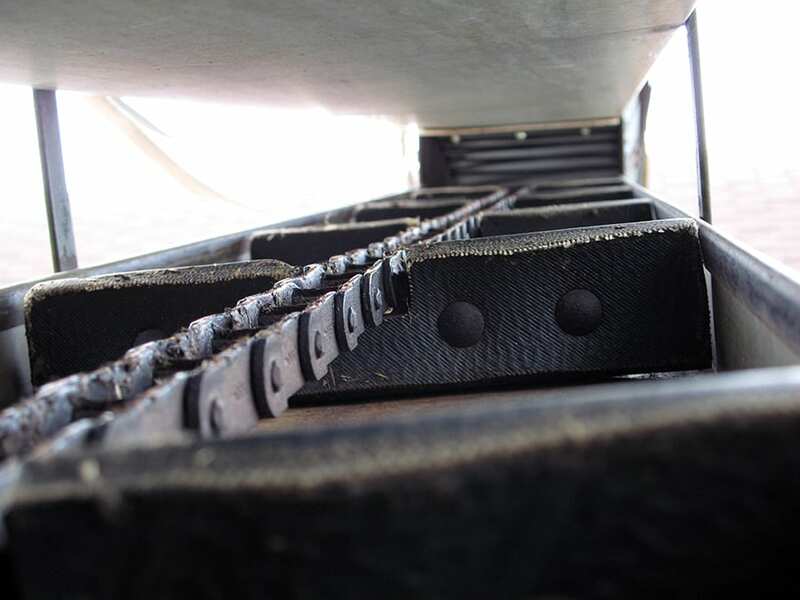 Our conveyors come equipped with OEM roller chains. This way, when a customer wants to replace a chain, they can go through any number of sources. Now, we do use a custom chain for our T-Series conveyor. We decided to design a custom chain for this conveyor because of high loads they are expected to carry. We also went with a custom chain because of the rough environment in which the chains often operate. To help the chains endure acidic wear associated with woody biomass, we designed the T-Series chain with an oversized pin. (In practice, the pin is what most often fails on conveyors handling woody biomass due to acidic corrosion.) Even when 50 percent worn, our pin is still stronger than the chain sidebars. An off-the-shelf chain will fit on our T-Series conveyor, however, so customers are not tied to us. But for the shear amount of abuse these conveyors take, a standard chain is suboptimal. Customers who choose to go with standard chain replacements in our T-Series will be disappointed in the chain’s performance. Want to know more about our conveyors? Click here to request an informational package with detailed information and links to brochures, videos, and images. This article was posted in General and tagged chain conveyors, Conveyors. Bookmark the permalink. Follow comments with the RSS feed for this post.Post a Comment or leave a trackback: Trackback URL. Like our blogs? Sign up for our newsletter to stay informed!